You can't fool around with fire safety on large sites like the chateaux of Amboise and Chenonceau. Your equipment and training has to be up to date and meeting current best practice codes. The fire in Notre-Dame de Paris has made everyone nervous and all the Loire chateaux are reviewing their procedures and equipment. 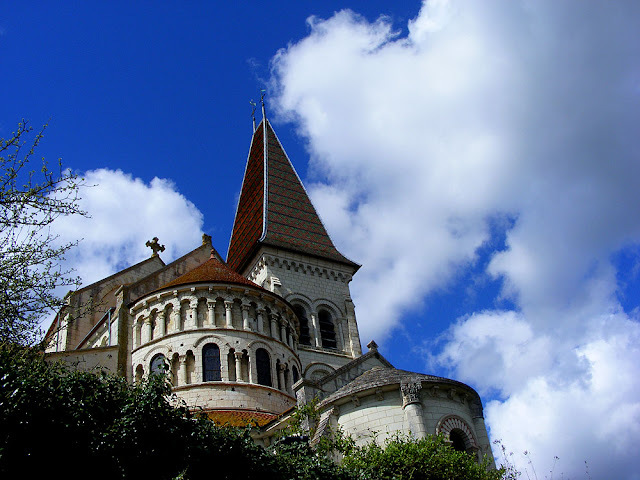 Like Notre-Dame de Paris, the big heritage sites follow strict rules in the matter of security, overseen by the State regulatory body whether the property is State or privately owned. The safety of people on site is paramount, and there must be sufficient equipment on site to enable the containment of the flames in the most rapid way possible. The Chateau of Amboise, for example, organises one or two fire exercises per year. A local exercise to rescue an unconscious person from a smoke filled workshop. Whether it is fire risk or terrorist attack risk, the procedures are similar and highly orchestrated. The sites are insured and the insurance companies monitor the chateaux's adherence to the rules. 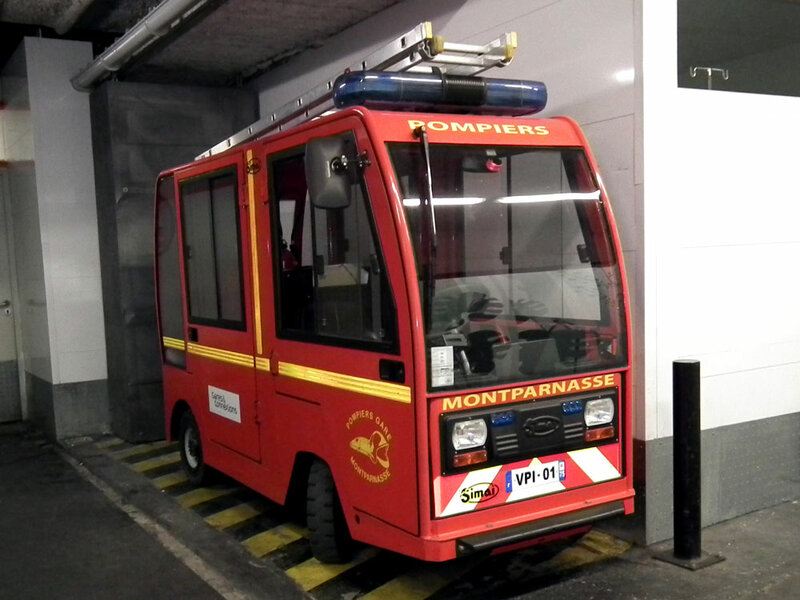 In addition to the regulations there is a written risk assessment done in conjuction with the fire brigade for each of the chateaux, with a very precise analysis of the potential risks and the equipment on site. 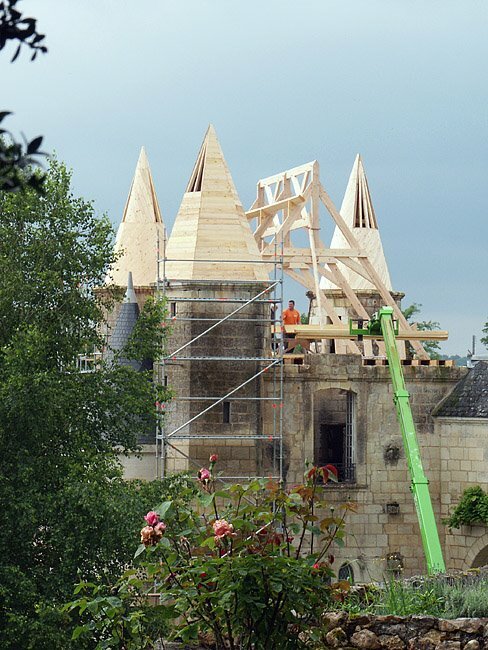 A fire damaged chateau roof is repaired. Staff are trained for the event of a fire and each has their alloted tasks and role to play. The written evacuation protocol, for a chateau such as Amboise, also includes the priority works of art and artefacts. In these old listed buildings, protocols for maintenance work are also strictly laid out and adherence is monitored. 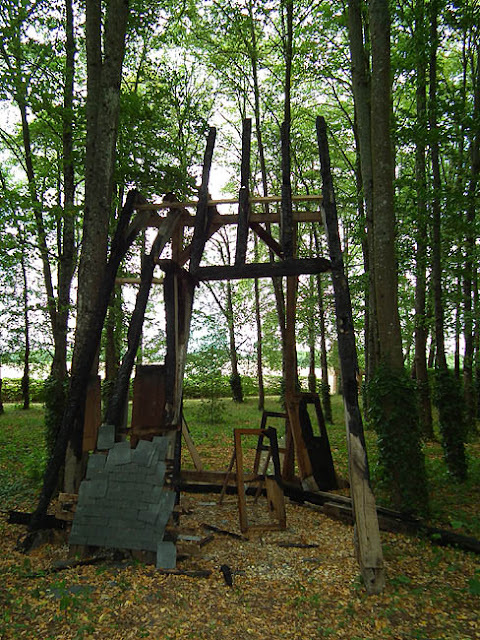 The remains of a fire damaged roof at the Chateau of Rivau, now turned into a memorial. At Chenonceau, a chateau that receives 800 000 visitors a year, they must put in place the means to prevent risks. Like any other monument it comes under the 2005 fire prevention regulations and these days has even gone above and beyond what it is legally obliged to do. They have appointed a chief fire officer and two assistants to the staff, whose role is to conduct fire drills on a monthly basis and do daily checks of the alarm system and security lights, all of which is recorded in the safety register. Chambord has a team of nine fire safety staff, plus access to all the mounted police based there. 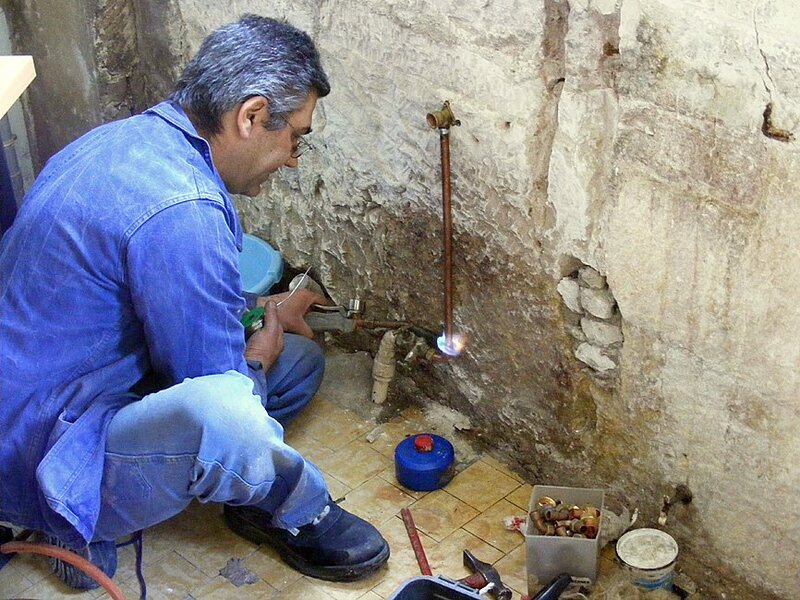 Braising copper pipes would require a permit, and most likely would not be allowed at all. The building has automatic detectors and sprinklers plus additional means of extinguishing a fire such as armed fire valves. Extinguishers are dotted about everywhere, there are fire hydrants and the site is equipped with a dry riser (a rigid pipe to which you can attach a fire hose), which allows the fire brigade to pump directly from the Cher. 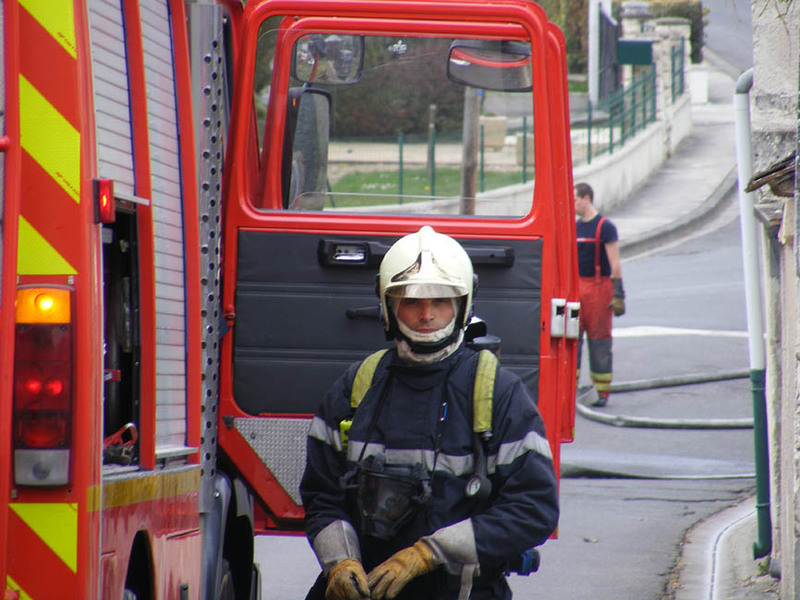 Chateaux and cathedrals pose particular technical problems for fire fighters and dry risers allow hoses to be fitted at different levels without having to run hoses up staircases or ladders. -- the sort of thing required for cathedral fires in old city centres. 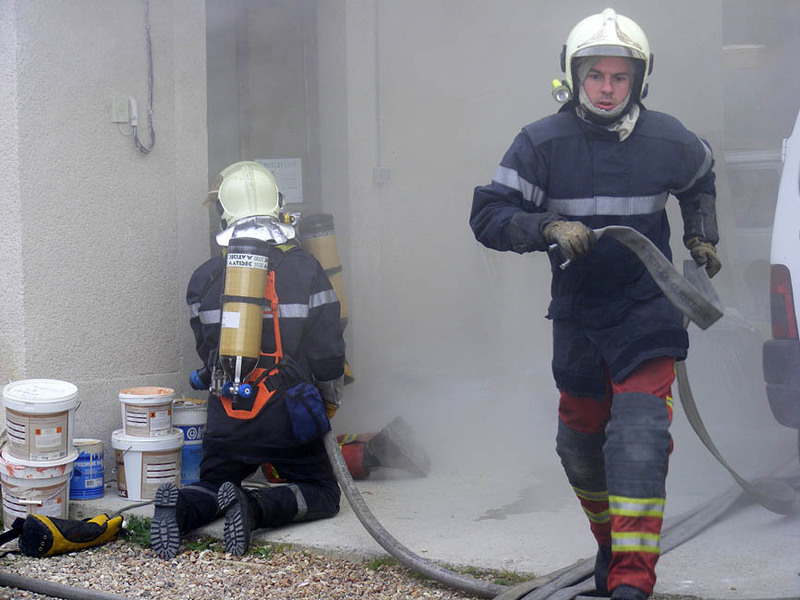 In March last year Chenonceau conducted a major exercise with the fire brigade, simulating a fire in the attic, with an injured person. A month earlier, the chateau of Blois had done a similar exercise. In October it was Chambord's turn. Any external cleaning or building company doing work on site must be logged in and out, and must keep their own fire safety register. The chief security officer developed and manages the procedures. Companies are monitored before and after their work by the security officers and the work is certified on site three hours after it is finished. Any hot work eg soldering, requires a permit. In the case of a fire the priority is the evacuation of people. From the sound of the alarm the staff at Chenonceau have three minutes to be in their positions and ready to act. The whole of the chateau personnel, which includes a lot of seasonal staff, is trained in evacuation procedures. This has to be particularly well rehearsed in these large old buildings where emergency exits may not be obvious to visitors. At Chenonceau the aim is to evacuate before the fire brigade arrive to fight the fire, but at Chambord, with more personnel, the aim is to simultaneously evacuate visitors and begin fighting the fire with extinguishers whilst waiting for the fire brigade to get there. The second priority is the removal of works of art, and there also, a written salvage plan is enacted. We are also on Instagram, so check us out to see a regularly updated selection of our very best photos. The sound track to my childhood was the Vietnam War. 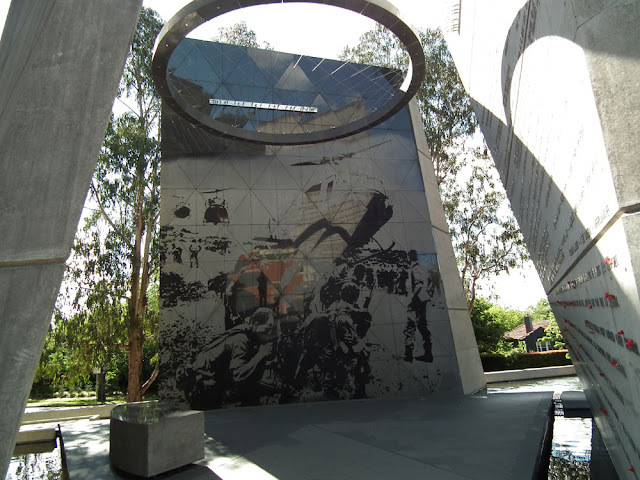 Sixty thousand Australians served in Vietnam and there is a memorial to them on Anzac Parade in Canberra. Australia's involvement began in 1962 and lasted until 1973. Australian troops went back briefly during the fall of Saigon in 1975 to evacuate Australian embassy staff. It is a memorial you can walk into and be enclosed by. There are six benches inside and around the space created by three concrete stele set into a pool. Each of the benches is dedicated to one of the men still listed as missing in action at the end of the war. Five hundred and twenty one Australians were killed in the conflict and about 3000 wounded. 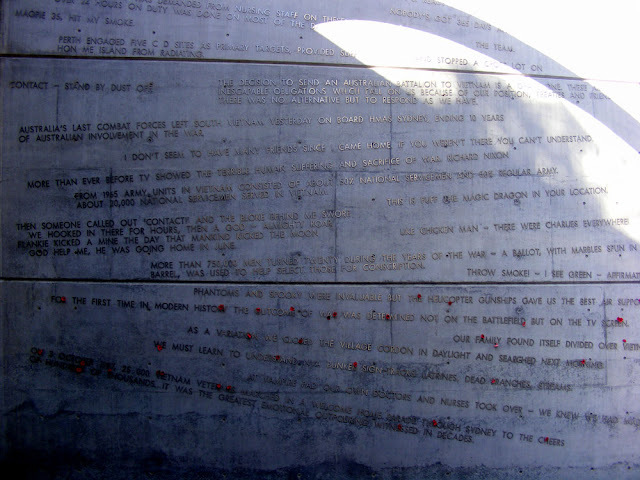 The names of all the Australians who died in Vietnam are recorded on a scroll which is sealed within the memorial. One of the stele has quotations from diaries, press releases and songs. Very few are attributed but several are very well known and their source would be recognised by many Australians. Troops waiting to be airlifted. The stele at the back is etched with a reproduction of a photograph of troops waiting to be airlifted by US helicopters back to their base at Nui Dat after a cordon and search operation. My uncle Ric was lucky to avoid the draft (whether you were called up was a lottery, based on date of birth for men in their 21st year), and Simon can remember Darwin airport heaving with soldiers en route to or from Vietnam when his family landed there when they emigrated to Australia from England in 1967. Today is ANZAC Day, the Australian official war dead memorial day. Here are some more photos from our walk from Preuilly, along the Sauvaget and back again. Part I is here. 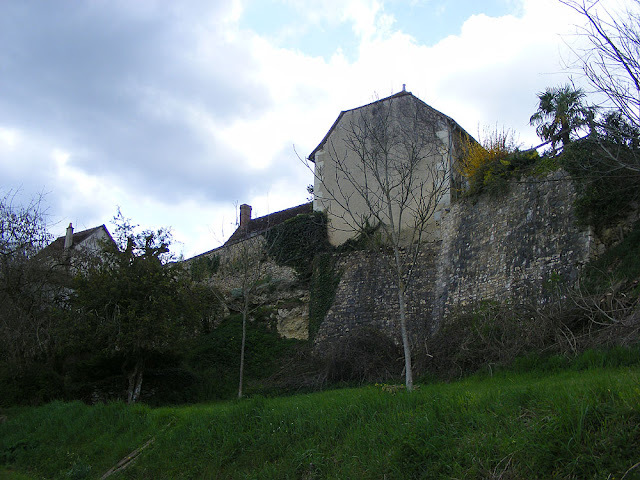 The back of the Abbey at Preuilly. This was taken in Preuilly from the top of the chateau's outer defensive bank, looking over Belvedere's garage roof. A male Eurasian Skylark Alauda arvensis (Fr. Alouette des champs) hovering and delivering his scritchy scratchy song, much romanticised by English poets, composers and writers. Passing some lovely flowering trees. 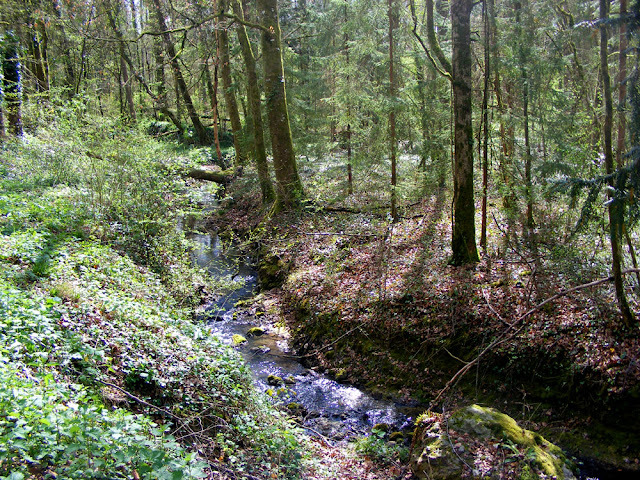 This little stream, the Sauvaget, provided the power to start the Industrial Revolution between Preuilly and Bossay. Mills along this tiny stream were processing locally mined iron ore. The setting for this house in a hollow is attractive, but I think a frost pocket. 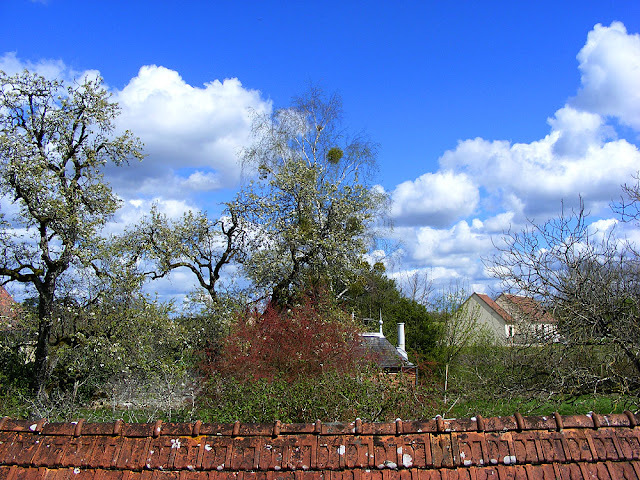 Flint nodules, no doubt gathered locally, topping a roof terrace wall in a hamlet along the Sauvaget. 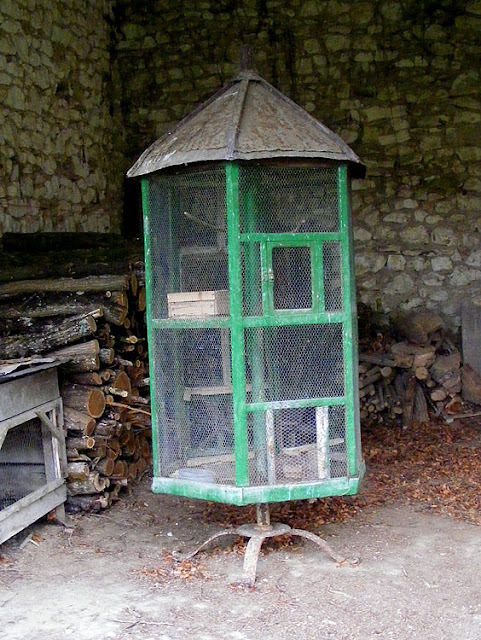 Antique bird cage (thankfully unoccupied). 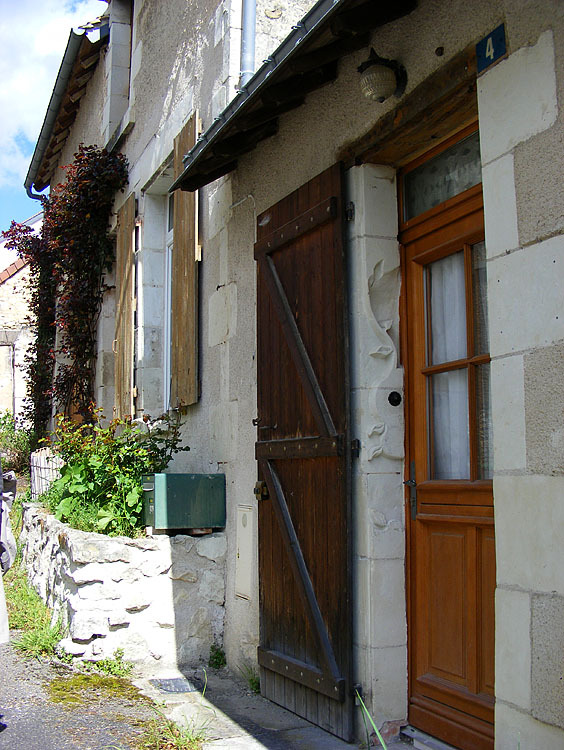 The rear entrace to a property in the hamlet of Sauvaget. 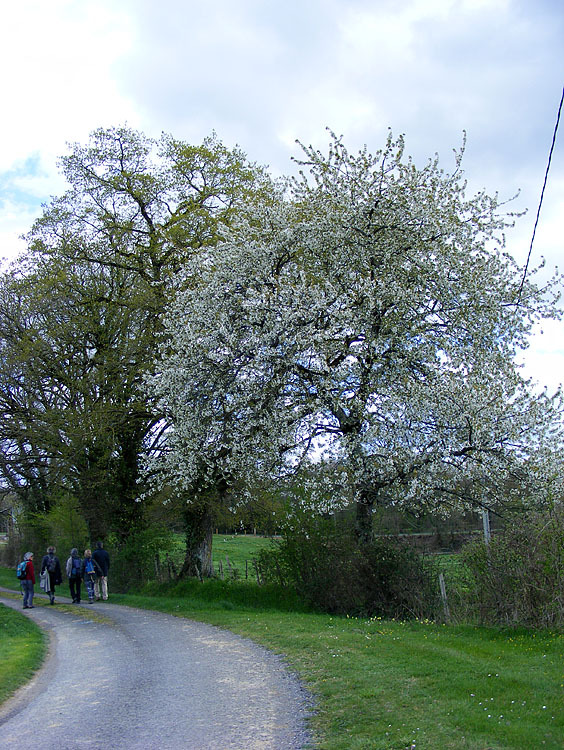 Blossoming pear trees in pasture. Typical rolling Claise Valley countryside. For those of you interested in how Facebook is undermining democracy, this is required watching -- a TED talk by journalist Carole Cadwalladr. I hope you all recognise the journalist's name and know how much courageous work she put in to revealing the irregularities of the Brexit referendum campaign. 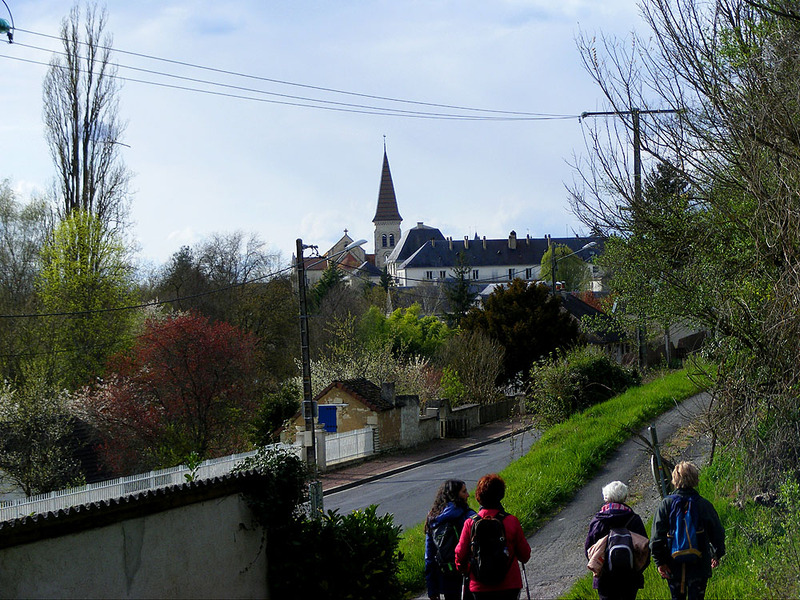 Thursday 4 April's club walk started in Preuilly and did a loop along the small Sauvaget stream which runs from the Forest of Preuilly to the Claise near Bossay. Here are some photos. The owner of this house in Preuilly is an artist, and has decoratively carved her front door surround. Whenever Simon and I walk by on our own these horses on the outskirts of Preuilly ignore us, but apparently a bigger group of walkers is something to come and investigate. 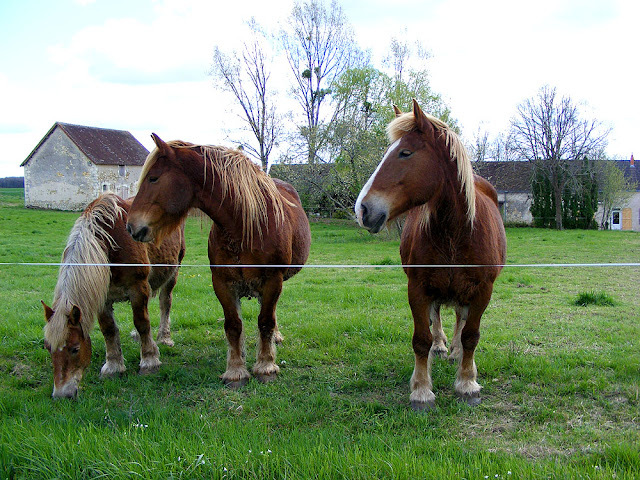 Ponies can never resist coming up and poking their noses over the fence at people. 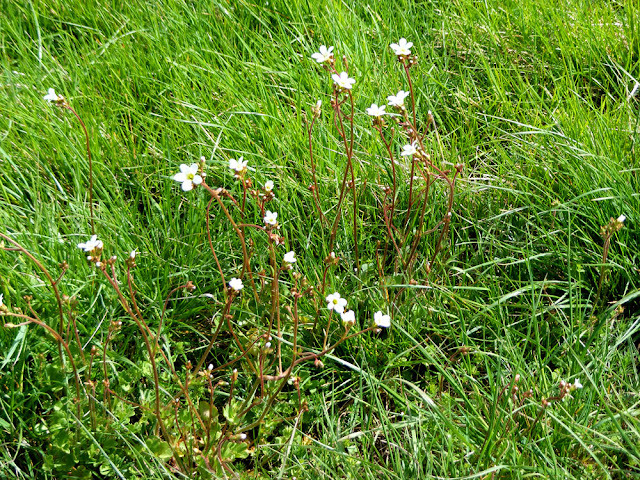 Meadow Saxifrage Saxifraga granulata (Fr. Saxifrage à bulbilles), a localised spring wild flower. Cowslips Primula veris (Fr. coucou) are at their peak in early April when these were photographed. 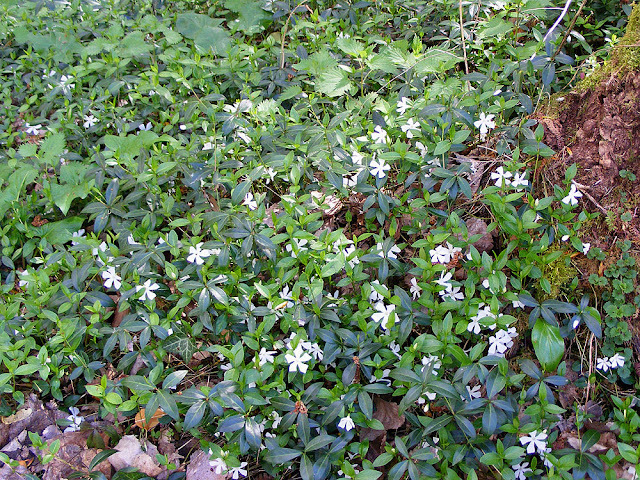 There is an extensive patch of this white flowered Lesser Periwinkle Vinca minor (Fr. 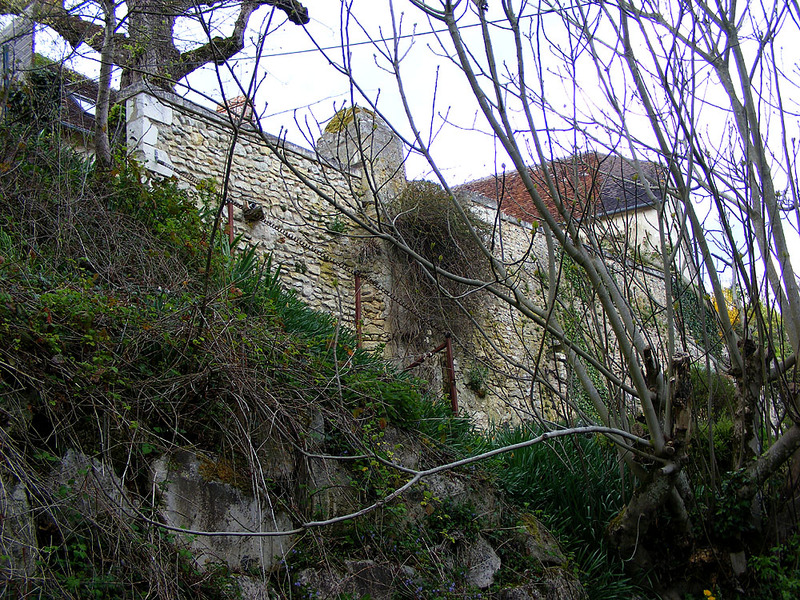 Petit pervenche) around the bridge over the Sauvaget near the site of a 17th century iron mill. 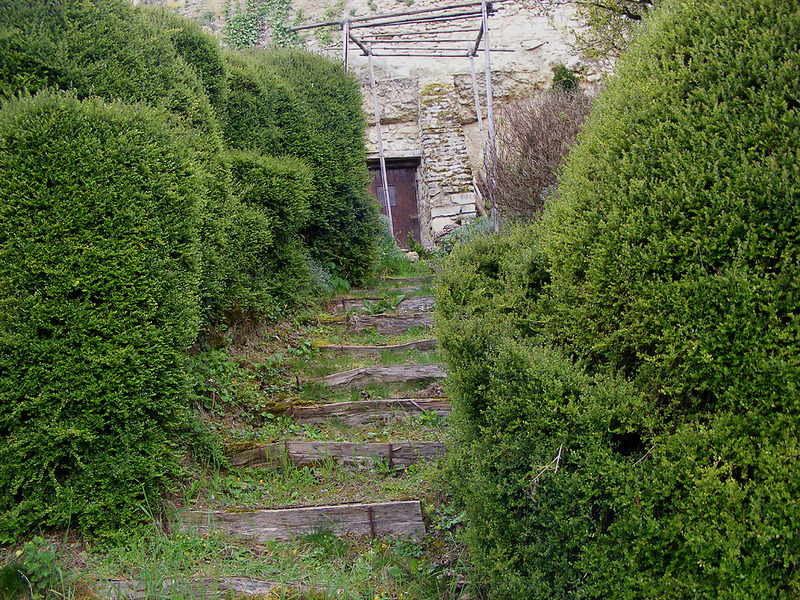 Expert opinion is that it is a garden cultivar, associated with human activity at the site. Vinca minor var alba was first scientifically described in 1770, so at some point a mutation must have occurred and come to the attention of professional horticulturalists who propagated and distributed it. Annoyingly, none of the wild flower guides mention this. They tell you that the flowers are always violet-blue. François Lefebvre, the ecologist responsible for the Zone naturelle d'intérêt écologique, faunistique et floristique along the Sauvaget says that he's read that the presence of Lesser Periwinkle is a good indicator of ancient occupation along former Roman roads. 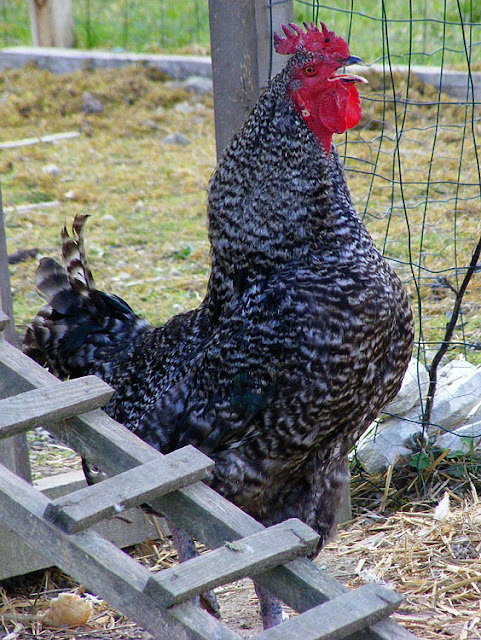 A rooster crowing in his new home of a week (his owners have just retired from goat cheese making and bought a house along the Sauvaget -- we stopped to chat with them). 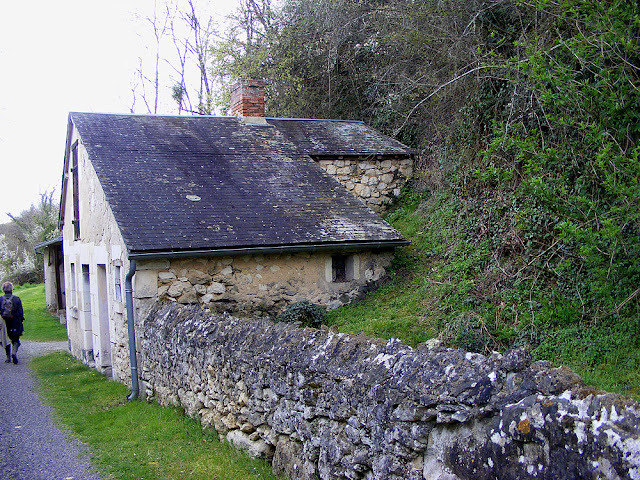 A semi-troglodytic cottage in a hamlet along the Sauvaget. The rather dramatic and unexpected hamlet of Sauvaget. Check out the twisted metal handrail on the stairs up to the back of this house in the hamlet of Sauvaget. 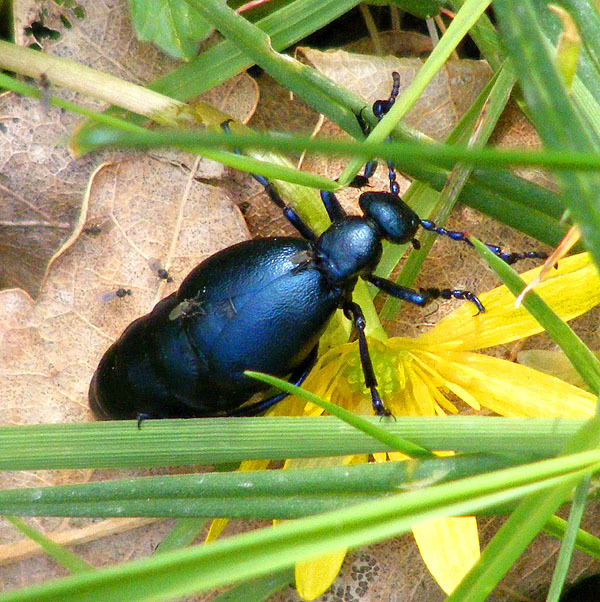 A male Violet Oil Beetle Meloe violaceus (Fr. 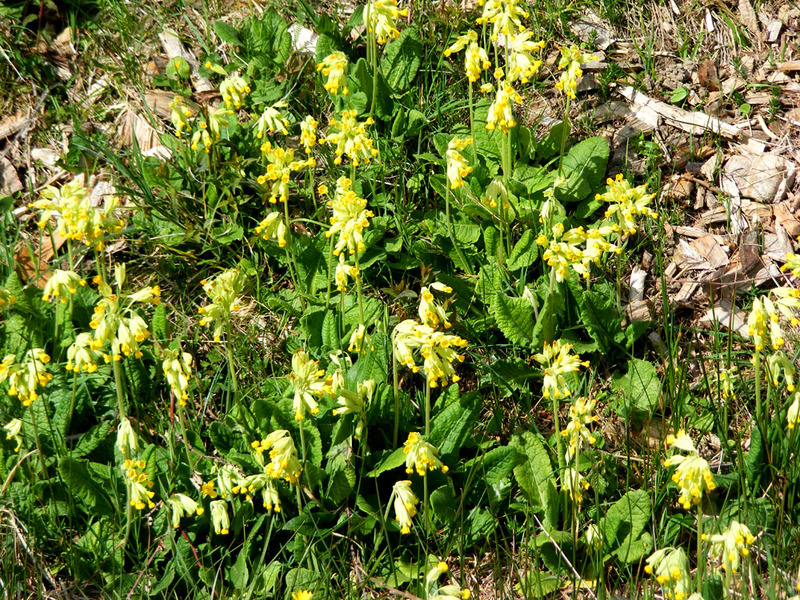 Méloé violet), munching on Lesser Celandine Ranunculus ficaria (Fr. Ficaire) and being ectoparasitised (externally parasitised) by biting midges Atrichopogon (Melohelea) sp who are feeding on the beetle's hemolymph (what beetle's have instead of blood). Many thanks to the members of Diptera.info for helping with the identification of the midges. This unctuous winter treat is my adaptation of a recipe that appeared on Taste of France. She can't comment on this blog due to technical reasons, but we've been communicating via her blog comments on how to tweak the recipe. She got it as an 'official truffle recipe' and chose to present it as the original, but because I resorted to shiitakes rather than truffles I felt free to modify it to my personal tastes and ingredients. Tear up the shiitake, add to the cream and blend in the food processor so the mushrooms are finely chopped. Leave to infuse overnight. Drain beans, put in a large pot, cover well with water, bring to the boil. Heat the oil in a large pot and sweat the onion, carrots and celeriac for 5 minutes. Add the beans and the stock. Bring to the boil, then reduce and simmer for half an hour. 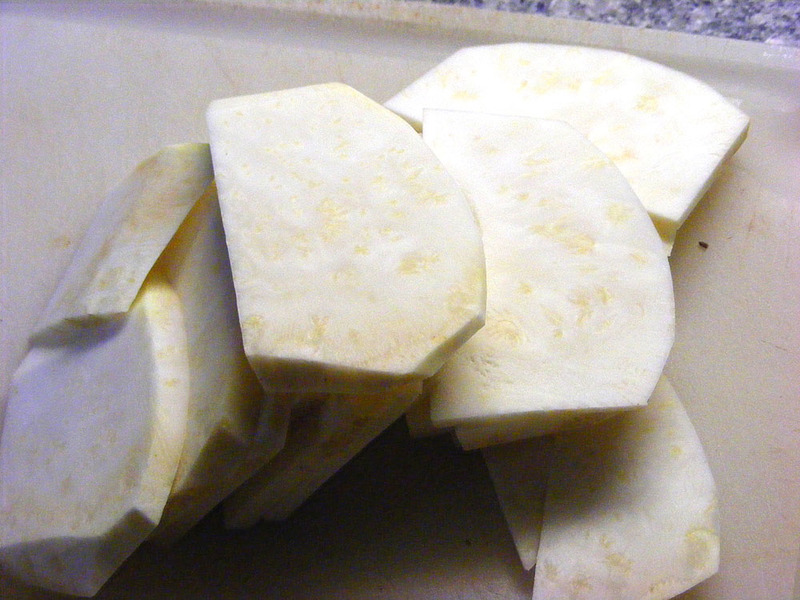 Remove from the heat then add the creamy mushroom mix and season to taste with salt, pepper and garlic. 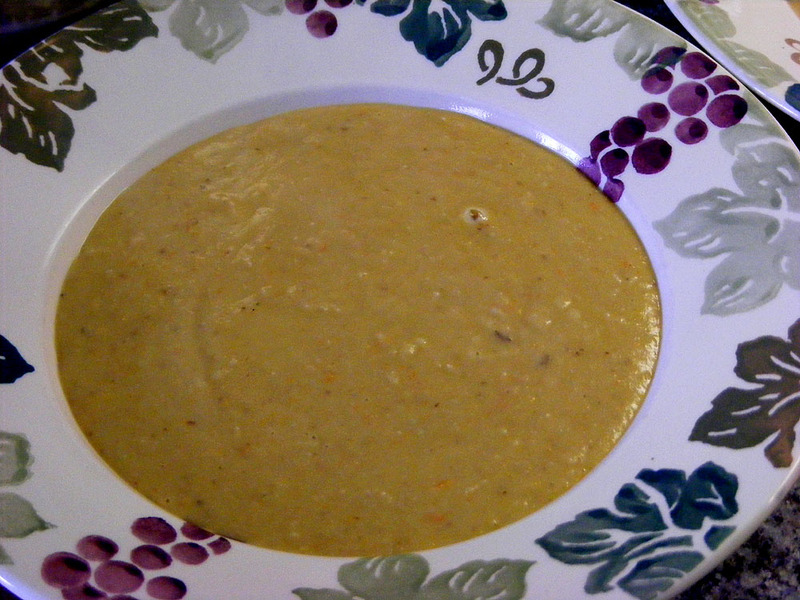 Using a stick blender, puree the soup to a thick velvety consistency. Gently reheat and serve. Feeds 9. 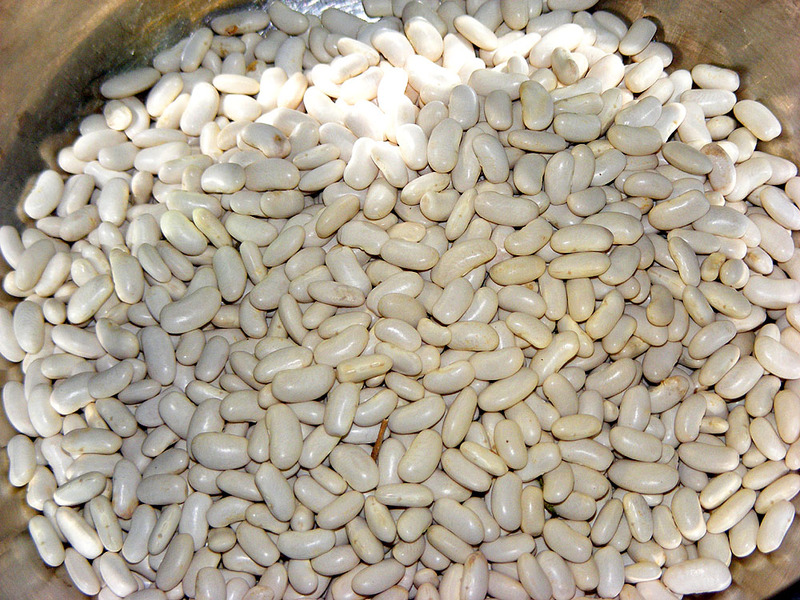 Locally grown white beans, known as lingots. *I had a kilo of lingots, so cooked all of them and froze half for use later. 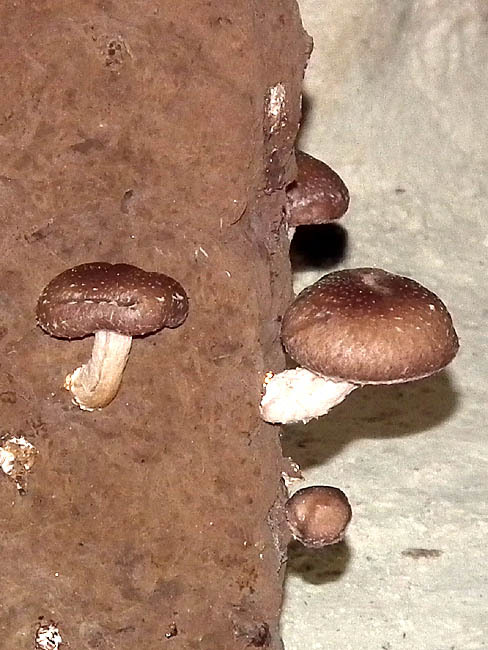 Shiitake growing in the caves at Bourré. 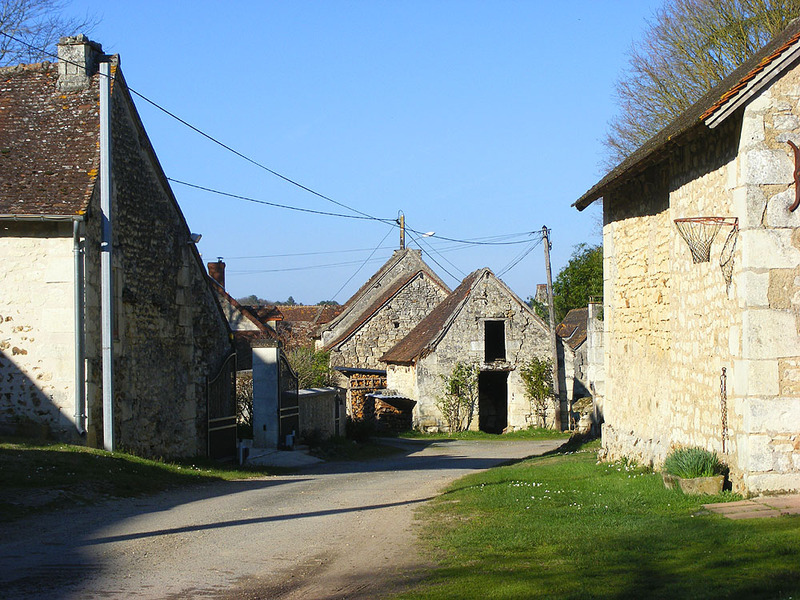 Hendrick, the mushroom producer who cultivates mushrooms in a cave at Selles sur Cher. He has a stall at the markets in Loches and Amboise, and I always buy my shiitake from him. 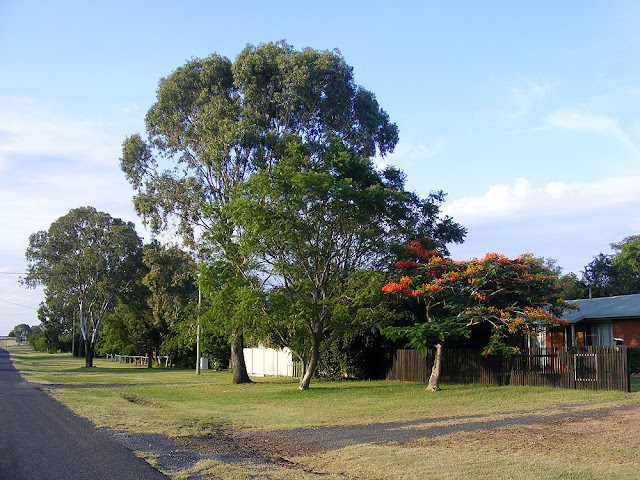 A typical streetscape in a small rural town in south-east Queensland. No curbing, with a wide 'nature strip' maintained and planted by the residents but owned by the municipality. No footpath, one simply walks on the grass. Most gardens are fenced around their boundary, probably because there are dogs or children living there. 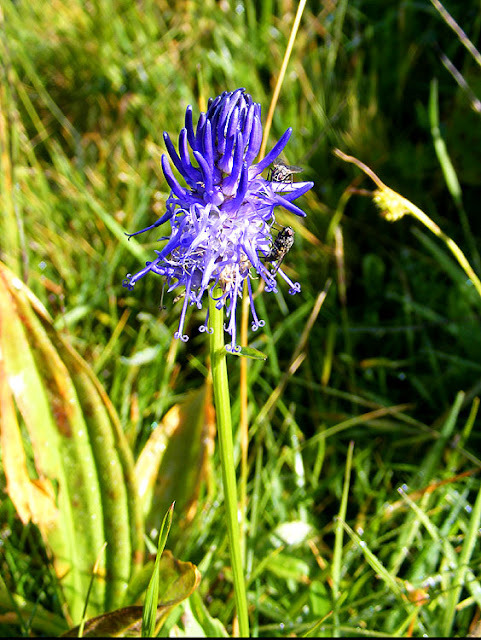 Betony-leaved Rampion Phyteuma betonicifolia is a properly Alpine plant. I photographed this one at nearly 2000 metres in Switzerland. The two flies are some sort of Muscidae, probably House Fly Musca domestica, associated with the nearby piggery. Both are female. 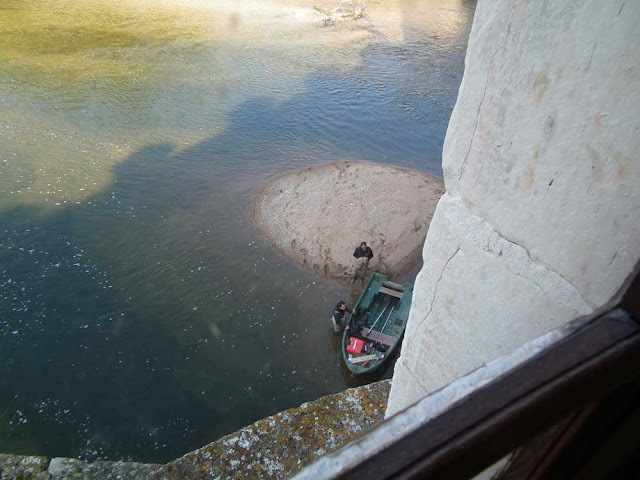 The level of the River Cher is much too low for April and it threatens the foundations of the Chateau of Chenonceau, which ultimately sits on wooden piles driven into the riverbed. There hasn't been enough rain this winter, and the lack of water is putting the stone arches of the long gallery at risk. The water level has never been this low before and there is concern that the wooden piles may soon be dry. With barely 30 centimetres of water for the past few weeks, the chateau is becoming vulnerable to vibration and cracking. The curator, Laure Menier, admits she is tremendously worried, not least because she dreads making an announcement of a catastrophe in the year of the 500th anniversary of Catherine de Medici's birth. Inspecting the foundations of the chateau mid-April 2019. 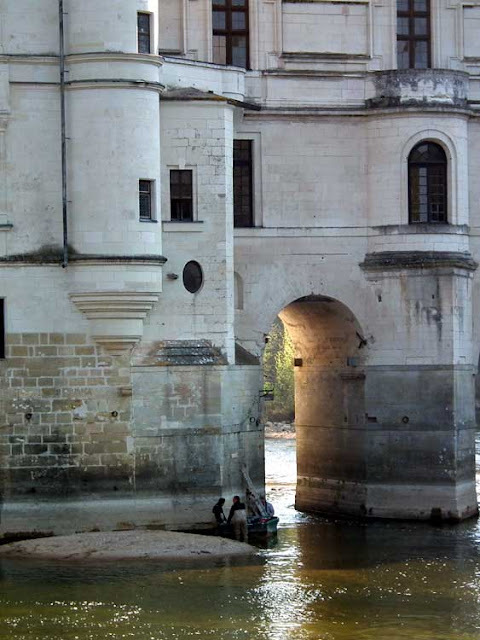 Normally, at this time of year the depth of the river at Chenonceau is around 1.2 metres. 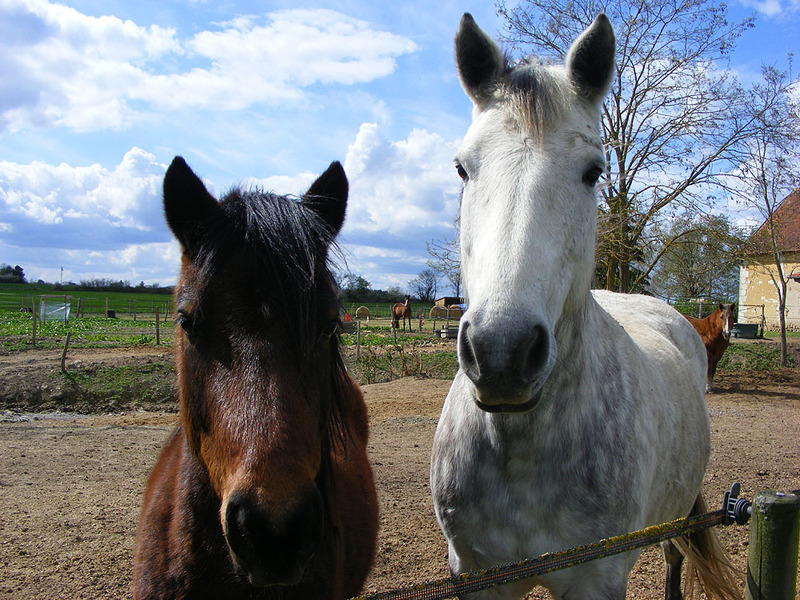 The lack of rain in the catchment area this winter, particularly in Cher and Indre, is causing the knock-on effect in Indre et Loire. As a result, the manager of the organisation in charge of the maintenance and improvement of the Cher, a State-owned river, has called for a derogation so the needle weir at Civray de Touraine can be raised early, so as to allow the water to back up to Chenonceau. You can see how shallow the water is around the chateau, and where the normal waterline is. The problem is that there is a European Directive which requires that the needle dams stay lowered until the end of May, to permit the passage of migrating fish. There is a project to create a bypass for fish and canoeists around the needle dam, but it has not yet commenced, and the fear is may come too late. Further Reading: Article in the Nouvelle République (in French). The Thursday 21 March walking club outing was along the Creuse River heights between Lésigny and La Roche Posay. 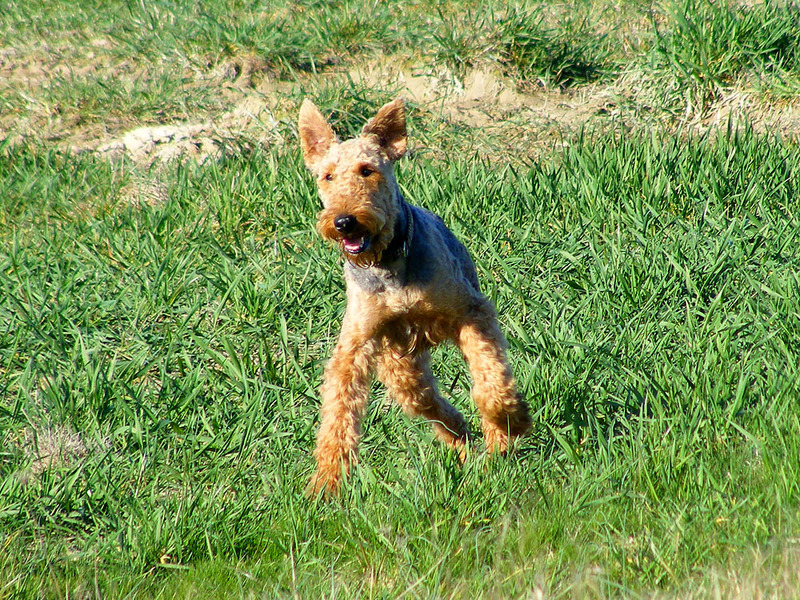 At the request of a regular blog reader there are more canine pictures. Two Roe Deer, on the left, easily evade Polly the Airedale, on the right. 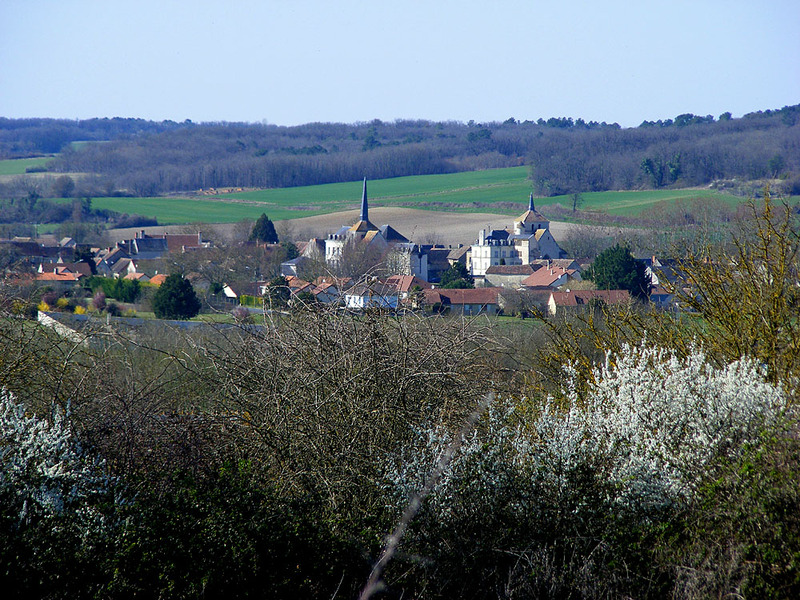 The distinctive twin churches of Coussay le Bois in the middle distance. 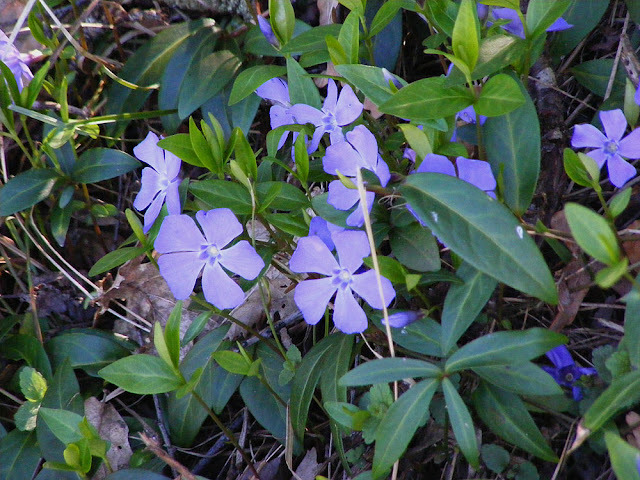 Lesser Periwinkle Vinca minor (Fr. Petite pervenche). Common Dog Violet Viola riviniana (Fr. Violette de Rivin). Garden Grape Hyacinth Muscari armeniacum (Fr. Muscari) with white hyacinth. Polly the Airedale careering across a field. Dairy cows head for the milking parlour. Alpacas in a farmhouse garden -- a rather unexpected sight. Hunting hounds in a kennel enclosure on a farm.